A famous golfer once said, “The more I practice, the luckier I get.” The words "professional golfer" on your bag do not make you a great golfer; it's the practice and dedication that impact your skill level. In the same vein, the title Team Leader, Manager, or VP on your business card does not make you a great leader. Leadership is a learned skill that needs constant refinement and adjustment based on real experience over time. Leadership is an art and a skill that's learned, but few colleges today adequately prepare students to emerge as strong leaders with successful leadership behaviors. Business schools may provide the tools and techniques of leadership, but business graduates are often ill prepared for what being a leader means in day-to-day practicalities. A misconception that those new to leadership roles often have is that they think they need to have all the answers to every problem or challenge. Nothing could be further from the truth. Great leaders actively solicit opinions, listen, and leverage the knowledge of the entire team in order to make their final decisions, and when making that final decision, ensure that the reasons for choosing one path over the others is explained in detail to the team. That increased understanding helps employees to understand and respect the decision, because they know that it was made with their thoughts considered in the process. Many believe that true leadership talent emerges when you are losing, not when you are winning. Your team will sometimes make wrong decisions, and as the leader, you will sometimes be perceived to fail. It is during those times that true leadership is needed. Rather than trying to find a scapegoat for a loss or a failure, great leaders accept that the responsibility falls on their shoulders. Lift the team up, ready them for the next challenge, and thank them all for giving their best. Prepare well, practice hard, and the next victory will be earned as a team. Every professional athlete in the world looks to improve his or her performance and strive for excellence. The same should be true of business leaders. Just as athletes look for outside opinion from their coaches, so too should leaders look for input on their performance from those around them. I believe that these leadership behaviors will be rewarded by hard work from the team, as they collectively strive to achieve a common shared goal. Upon attainment of the goal, it is important to celebrate and recognize those on the team who have excelled. 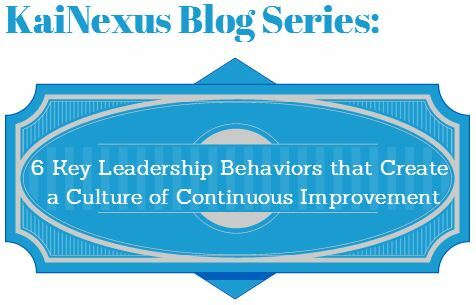 By applying all of these basic principles, leaders will lead their cultures of continuous improvement well. Be sure to subscribe to our blog to make sure you catch the whole series, and our future posts.